Tipard iPhone Software Pack, integrating DVD to iPhone Converter, iPhone Video Converter, iPhone Transfer Ultimate , and iPhone Ringtone Maker. It can convert DVD and video to iPhone compatible video MP4, H.264 and MOV. Besides converting function, it's able to transfer music, movie, picture, camera roll, SMS (MMS) and make iPhone ringtone. Why choose Tipard iPhone Software? Tipard DVD to iPhone Converter possesses ability to convert DVD to iPhone supporting formats. You can load DVD disc/DVD folder/DVD IFO file. 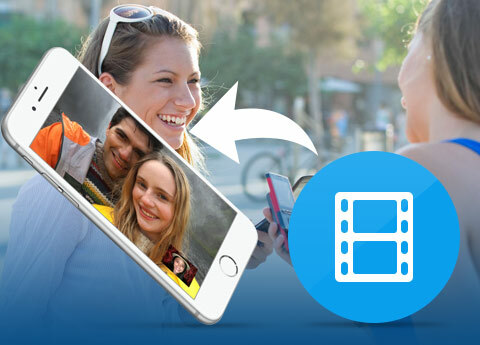 With this converter you can convert almost all DVD to iPhone compatible formats, such as convert DVD to MPEG4, H.264, M4V, MOV video, etc for playback on your iPhone. With its multiple output formats, this converting software can support many fashionable devices, like iPhone XS/XS Max/XR/X, iPhone 8/8 Plus, iPhone 7/7 Plus, iPhone SE, iPhone 6s, iPhone 6s plus, iPhone 6, iPhone 6 plus, iPhone 5, iPad Pro, iPad mini, iPod touch, iPod nano 7, and so on. Furthermore, the iPhone Converter software allows to extract your favorite audio from the DVD, and you can convert DVD to iPhone audio MP3, M4A, AAC, WAV with super conversion speed and excellent quality. Tipard iPhone Video Converter has powerful functions of converting various videos to iPhone supporting formats. It converts almost any standard definition video files such as AVI, MPEG, WMV, MP4, MPEG, etc. supported by iPhone XS/XS Max/XR/X, iPhone 8/8 Plus, iPhone 7/7 Plus, iPhone 6/6 Plus, iPod nano, iPad Mini, etc. It also serves as a high-definition iPhone video converter and it is capable of converting HD videos to iPhone, such as HD H.264 to iPhone format, HD M2TS to iPhone format. Its plentiful supporting formats makes the converter compatible with most present popular portable devices, like iPhone XS/XS Max/XR/X, iPhone 8/8 Plus, iPhone 7/7 Plus, iPhone SE, iPhone 6s, iPhone 6s plus, iPhone 6, iPhone 6 plus, iPhone 5, iPhone 4S, iPod touch, iPad Pro, New iPad and so on. 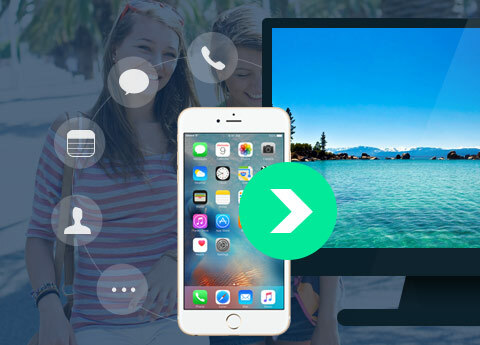 Video to iPhone Converter also can extract audios from video files. If your iPhone's space is almost used out, you have to back up or delete some files. Or you're anxious about losing iPhone so as to miss everything in iPhone. In that case, back up your iPhone content to computer in advanced. The software is capable of transferring music, movies, pictures, camera roll, SMS (MMS) and contact from iPhone to PC in order to release space. Moreover, the software can help you import audio, video and pictures to iPhone from computer directly. 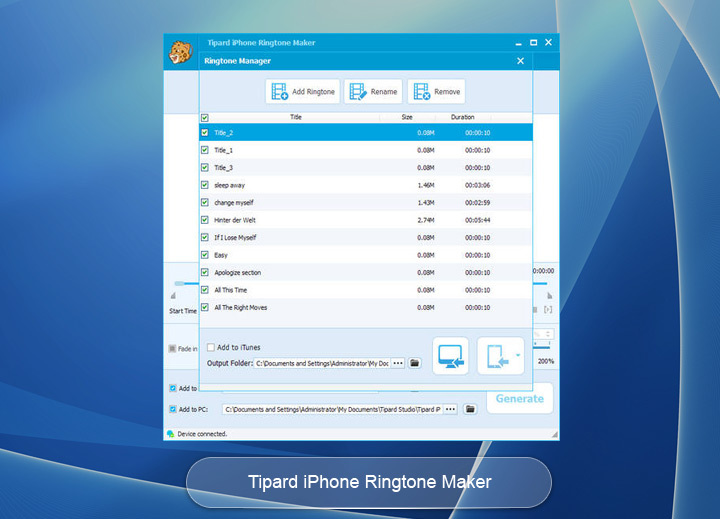 Tipard iPhone Ringtone Maker for Mac can convert almost all mainstream video / audio to M4R iPhone ringtone on Mac. Then upload converted ringtone to iPhone XS/XS Max/XR/X, iPhone 8/8 Plus, iPhone 7/7 Plus, iPhone SE, iPhone 6s, iPhone 6s plus, iPhone 6, iPhone 6 plus, iPhone, iPhone 4, iPhone 3G, iPhone 3GS directly. Furthermore, this Mac iPhone Ringtone Maker also helps you create iPhone ringtone from any video/audio and convert it into iPhone ringtone. 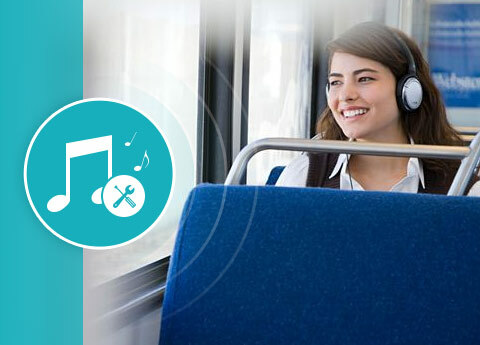 You can convert any loved music to iPhone ringtone such as convert WMA, AAC, WAV, MP2, MP3 to M4R iPhone Ringtone on Mac. Upload ringtone to iPhone directly. No iTunes needed, this Mac iPhone Ringtone Maker can directly transfer the converted ringtone to your iPhone. With this professional tool, you can remove your ringtone from your iPhone as you like and rename your Ringtone at your favor. 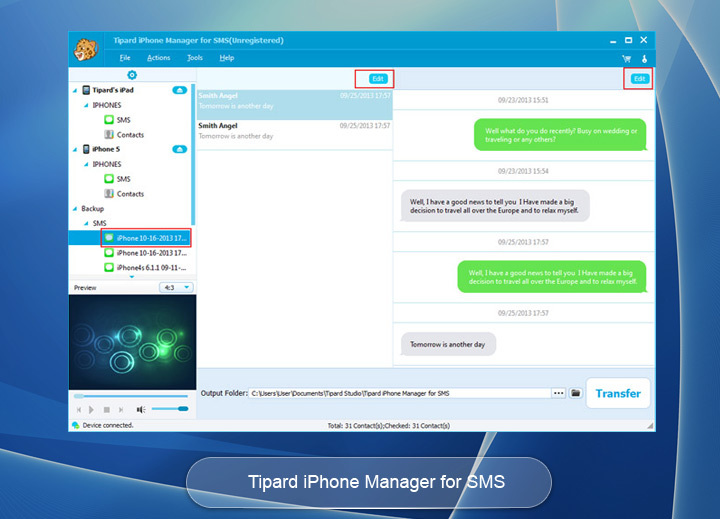 Tipard iPhone Transfer Ultimate is the best iPhone SMS transfer app, which features with helping users backup or manage your iPhone SMS. It can also be used to transfer and copy iPhone contacts. Moreover, it can backup/transfer all iPhone SMS/Contact, including iPhone 6s/6s plus.Tipard iPhone Transfer Ultimate makes it a breeze to share files among different iOS devices. You can connect your devices to computer and transfer files directly, or transfer iPhone files to computer then import to iPhone. 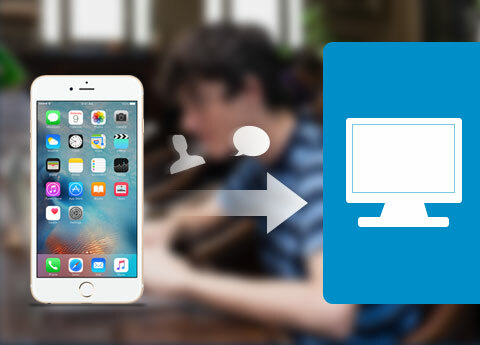 With this function, you can transfer iPhone contacts to new iPhone, transfer music from iPod to iPhone, or transfer iPad videos to iPhone. It can enable you remove your ringtone from your iPhone as you like and rename your Ringtone at your favor. Intuitive Interface with Stunning Design. Packham:If you're in trouble of how to manage your iPhone as you wish, Tipard iPhone Software Pack is the right software to provide all-round solution for your worries. August: During the summer holiday, my family had a long trip. Thanks to the software, it made my kids spend a relaxed and happy plane trip. I converted their many DVD movie discs to iPad. The video quality is quite well. Rip DVD and convert various video to iPhone H.264, MP4, M4V, ALAC, etc video/audio formats with high output quality.